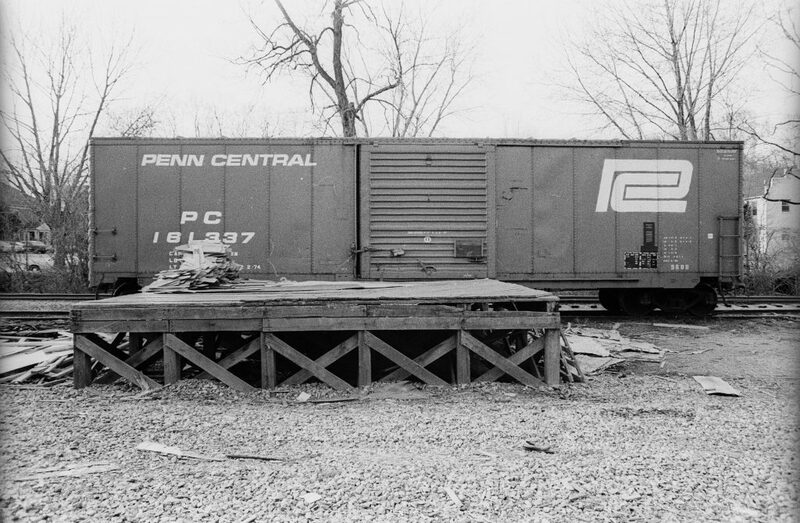 1976: Photos of Penn Central Boxcar at Conn. Av. PC 161337 is an ex NYC Class 968B box car. A gentleman named J. Shriver contacted me via email and shared some wonderful photos (Click link to view the whole Gallery!) he shot himself back around 1976 of a Penn Central box car spotted on the passing siding at Connecticut Ave. At this point in time, the team track (which was just behind the photographer) was probably out of use and the passing siding had been designated for unloading at the freight platform. At one point, there was a gantry crane here but it appears to have been removed. I’m not sure how far back this platform itself dates, but I would wager some time in the 1940s or 1950s. PC 161337 is an ex NYC Class 968B, “Class 968B was constructed between 1965-68 at the NYC’s Beech Grove, IN shops by stretching older 40′ cars into “new” 50′ boxcars.” (More info here: http://conrailphotos.thecrhs.org/node/21883) Note all of the discarded packing material that was likely from whatever was inside the car, strewn about on the ground and the loading dock. Well I see the new year has been treating us graciously with plenty of new pics!